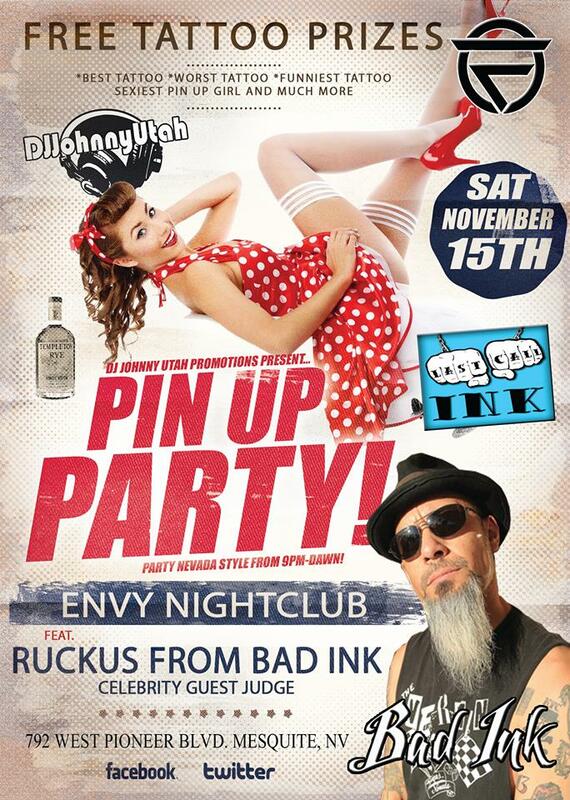 Saturday- Pin Up Girl Party at Envy Nightclub! Saturday 9pm-DAWN. Celebrity Guest Judge Rob Ruckus from A&E’s Bad Ink TV Show and The FreeOnes Performing! Sponsored by Last Call Ink in St George! FREE $200 Tattoo for the Sexiest Pin up Girl. FREE $200 Tattoo for the Best Overall Tattoo. FREE $50 Tattoo for the Funniest Tattoo. FREE $50 Tattoo for the Worst Tattoo. FREE $50 Tattoo for the Most Original Tattoo. FREE $50 Tattoo for the Ruckus Choice Tattoo. FREE $50 Tattoo for 2nd Place Sexiest Pin up Girl. FREE $50 Tattoo for 3rd Place Sexiest Pin up Girl. No Cover Charge for the Ladies all Night and No Cover Charge for the Guys before 1030pm. After 1030pm its only $5 for the Guys. First 20 Ladies Get 2 FREE Drinks. Its also DJ Grid’s Birthday Party so come wish him a HAPPY BIRTHDAY!